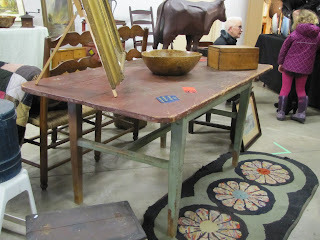 Folk Art in the Attic: Enjoying the Cure for Cabin Fever - The Kingston Winter Antique Show! Timing, as they say, is everything. And arguably, the promoters of the Kingston Winter Antique Show, Cabin Fever have the timing of their event spot on. As it has done so effectively for the past years, Cabin Fever is a timely elixir for the pent up desire of collectors to indulge their passion in mid winter, when the prospect of outdoor antique shows in the warm days of Spring and Summer still seems like a distant fantasy. After a long drive on the 401, there’s nothing quite like the feeling of hustling through the frigid parking lot of the Portsmouth Olympic Harbour Building and entering the main exhibit space filled with colourful antiques and collectibles. I have to warn readers in advance that this is not a detailed, booth by booth account, of show. It is more of a general over view, a quick snapshot of the event as I moved quickly, along with hundreds of other patrons, through the show. I'll also admit that there wasn't rhyme or reason to my viewing. I simply started to wander through the aisles. If I had an objective, it was to key in on one particular piece in each booth that impressed me. My tendency at shows is to to do one fairly quick circuit and then proceed more slowly through the booths on subsequent passes. And even with this rather sketchy plan, it is easy to be distracted. At its’ heart Cabin Fever is a “country” antique show with other areas of collecting added here and there to contrast with the main theme of pine furniture and accessories, much of it in original paint. And while the 2016 event is smaller in size than previous versions, this year’s dealers put on a show that still packed a solid punch. It’s an almost dizzying experience, at least initially, trying to take in all of the interesting antiques and collectibles on display. Crowded aisles and booths also make viewing a challenge but that’s all part of the opening day’s chemistry. There's no such thing as "early" entry at this show. By design, this produces a heightened sense of anticipation and eagerness among the hundreds of patrons lined up in concentric circles in the lobby of the Portsmouth Olympic Harbour building. Keeners are there one to two hours in advance, if not longer, so as to be among the first in the door. If you want the chance to buy certain objects, you have to be there early. Since the show is promoted in advance through social media channels, collectors know in advance about particular pieces being brought to show by dealers. The rumour mill also works in high gear weeks and months before the show and this also adds to the sense of anticipation in the line up. Grey haired and aging collectors, myself included, may not have the spring in their step like they once had, but they are still a very determined bunch. So, let me now try to get down to specifics. Michael Rowan is a veteran of both Cabin Fever and the Bowmanville Show and always brings interesting and quality items to the shows in which he participates. On the back wall of his booth his small bucket stand with some nice stoneware and a neat little miniature blanket chest caught my eye. The pail stand was in an old surface, dated to about 1850 and was priced at $875. 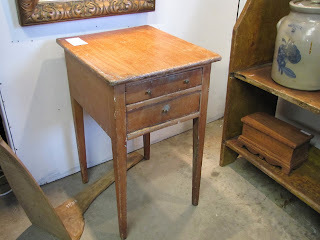 Beside it was a honest, small tapered leg side table from Nova Scotia. It too was in an old surface and priced at reasonable $350. The Rowan pail stand with stoneware. The NS two drawer stand. David Purcell's booth caught my attention early on. David was rightly proud of a c. 1840 harvest table that was front and centre in his booth. The H-stretcher base table had an untouched two board top with an early green over paint on the skirt and legs. The table was just over five feet in length. The stretcher was set unusually high up which made it more practical to use. All in all it was an impressive piece of country furniture and it sold within the first half hour of the show. Waterloo high stretcher based table of David Purcell. Elegant burl bowl sits centre on the table. What will now be known forever as Colin's Cow sits in the background. David also sold two other pieces of furniture likely becoming the Furniture Man of Cabin Fever for 2016. Sitting on top of the table was a large wooden carving of a cow. It was an attractive piece of folk art for $595 and as we know from other postings on the FB Canadiana site, Colin Latreille pulled the trigger early on and bought it for his collection. Also placed on the harvest table was an elegant burled bow at $2,500 in fine condition. Roughly 16 inches in diameter, it also sold, this time to a visiting dealer. Gary Dawson's "shoe" trade sign sitting atop a small brown jam cupboard quickly caught my eye. It was in nice original condition and priced at $1875. 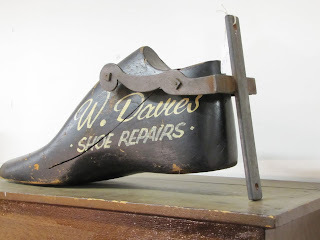 The Davies Shoe Repairs sign in Gary Dawson's booth. I saw Ben Lennox zone in on the piece and as evidenced by photos on FB later in the evening, the sign went home with him. At $465, I liked the little jam cupboard in original grained paint upon which the sign was placed. Gary and I are both perplexed as to why that little gem doesn't find a home. Talking to Ben later, he mentioned several other purchases he made including three pieces of redware from Scott Wallace of Maple Leaf Auctions. Those purchases included a redware syrup jug which I had picked out of an old Ottawa collection a year or two ago. Whenever I passed by Scott's booth during the morning, he was busy concluding transactions with other collectors. In decorated stoneware, it doesn't get a whole lot better than this! Several lines of script and a great blue decoration. Offered by Scott Wallace. As many readers know, Scott runs Maple Leaf Auctions which typically has two on line auctions per year. Last Fall marked auction #40 in which Scott sold the now famous amber coloured American Beaver fruit jar for $14,500. Scott has shrewdly, over time, focused almost exclusively on the sale of stoneware, redware and bottles. As he has proved with his auction results, these are areas of collecting that have withstood the vagaries of our longstanding sluggish economy. Just one grouping of stoneware and redware of several in Scott Wallace's booth. Scott was so busy "wrapping and packing" he only had time for a quick "hello." There was one item in Locke and McKenzie booth that was hard to miss. It was a model canoe from the Chestnut Canoe Company of New Brunswick. I was at the show with a friend who is a vintage canoe enthusiast and he explained that this was a showroom sample. It was likely made he said for a retailer of the canoes. 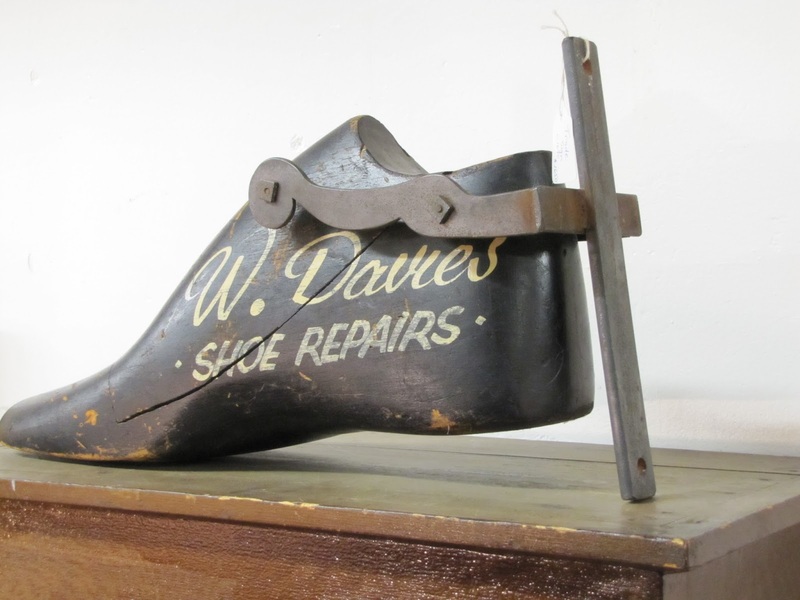 The model dated to the early 1900's was in original, as found condition and was priced at $8,500. It had apparently shown up in a Cornwall, ON auction this summer. My friend was out of town that day and missed the sale. His attempts to buy the canoe from the successful bidder did not, much to his frustration, bear fruit. The Chestnut Canoe model in Ed Locke's booth. About 8 feet in length in as found and remarkably good condition for its age. Bill Breeze of Otter Creek Antiques had what I thought was an attractive D table that he purchased recently in Lanark County. It is not a form that one sees often especially in Eastern Ontario. In an old varnish finish, Bill had the table price at a reasonable $675. Quite rare this D table from Lanark County in as found old varnish, $695. Would look good in any collection. By this time, "sold" stickers were popping up all around. I noticed that Adrian Tinline had several sold stickers on furniture items in his booth. As I passed by on another circuit, customers were picking up their purchases from Adrian including a cute little side chair in over paint and a small wall box. I missed the prices on those items. Later, I lent a hand as Adrian and Ben moved a drop front desk in paint out of Adrian's booth and into the foyer for pick up. Adrian Tinline likes a full booth! And this is only a partial shot! After two hours it was looking much less so as the drop front desk on the left and the sideboard in centre had both sold. 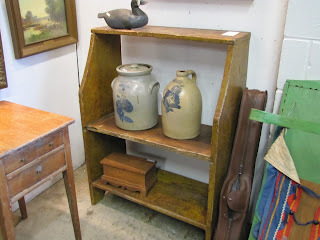 Country furniture was also moving in the booth of Smith's Creek Antiques (Clay and Carol Benson). An open corner cupboard in paint sported a sold tag in fairly short order. I am sure the purchaser was attracted to the paint and to the convenient size of the cupboard. 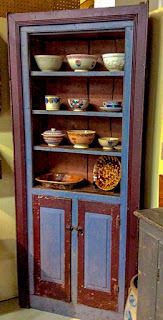 Small, open corner cupboard in old, two tone paint. No restoration but at one time had a door added to the top portion. About 1830. Smith's Creek Antiques. Sold. Photo by Colin Latreille. 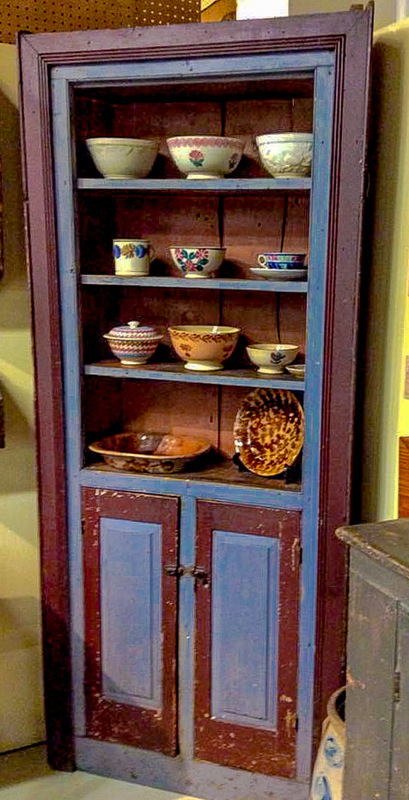 Clay and Carol always have a superb line up of painted furniture, several furniture examples in figured maple plus folk art, stoneware and redware. Carol Telfer offered some beautiful quilts, hooked rugs and textiles. Nicely presented, all in superb condition, the soft textures and strong colours of the textiles are a refreshing change from the harder surfaces of furniture and stoneware. Carol's textiles are colourful, graceful and elegant and obviously chosen with great care and attention. One stunning Grenfell rug of a polar bear etc priced at $1250 certainly caught my eye. Larry Foster had many nice small pieces of accent furniture, several folky ship paintings in various sizes, a nice blanket box in paint in full size. Dealers from Quebec were prominent in this year's Cabin Fever. 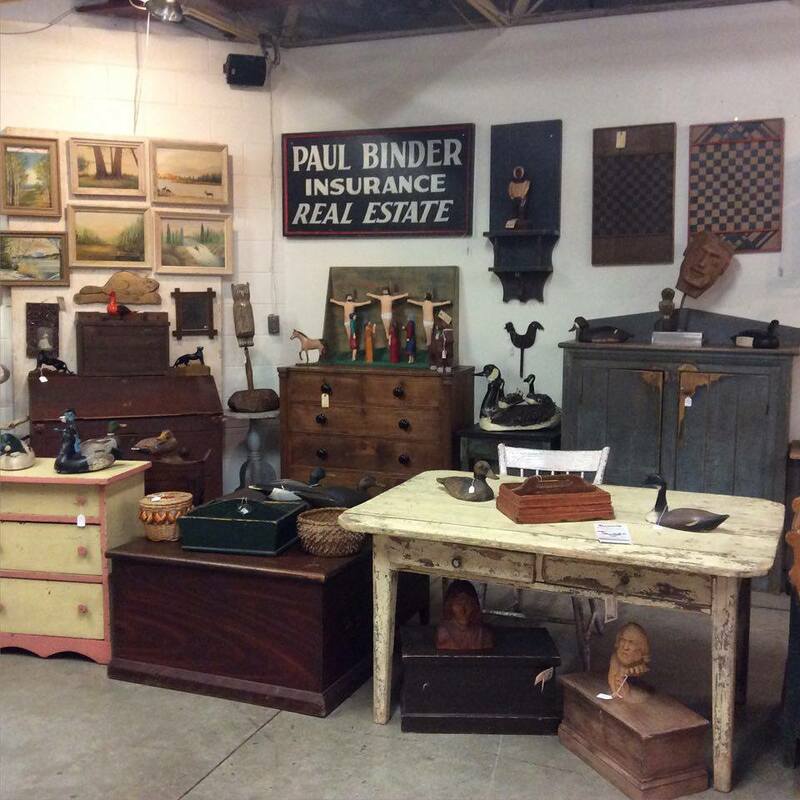 Peter Baker always sets a high standard for his booth at an antique show. He met the mark with this year's offering. Peter always seems to have a terrific long table, one or two excellent case pieces of furniture and a variety of smalls that round out his booth. In the first hour or so it was difficult to even get into Peter's booth. I saw furniture selling from the booth. My friend Steve Cunliffe left Peter's booth with a very nice tavern stool held over his head as he threaded his way through the crowd in the aisle in front of Peter's booth. L'Oiseau Rare had an elegant offering of furniture and folk art. It was hard not to miss the child size blanket chest perched on a table in the centre of their booth. I photographed the accompanying price tag and include it here for accuracy. I broke off my tour of the show around noon to have a pre-scheduled lunch with a friend. Returning to the show an hour or so later the opening melee had tapered off and I could meander more slowly through the show. On this sober second tour, I was able to look more carefully for items in booths that I missed earlier in the morning. At one point, I stood back to admire several stunning hooked rugs in the booth of Barry Ezrin. Folky, colourful and in a great condition, Barry apparently found the rugs in the attic of a house on St. Joseph's Island in North Western Lake Huron. St. Joseph's is the second largest island in Lake Huron after Manitoulin. Dating to the 1930's, the rugs were wrapped and well preserved when Barry found them. He offered the large ones at $1,000 and the smaller ones at $600. Now don't you wish that every house call turned out half as well as this one! I do! Instant folk art collection for a reasonable sum! The St. Joseph's Island hooked rugs of Barry Ezrin. Wouldn't they look good in a cottage! Barry's other noteworthy items included a stellar six foot harvest table with a set of six green arrow back chairs to go with it. I would be remiss if I didn't reference the booth of J. C. Miller Antiques. This booth doubtless had the most impressive flat to the wall cupboard in the show plus many other interesting and high quality pieces. I also admired a small-scale chest of drawers in walnut with burled walnut drawer fronts. If I recall the price was in the $700 range. In superb original condition, it was sold and gone when I wandered through their booth an hour or two later. For my money, their colourful folk art plane was one of the nicest pieces of folk art in the show. 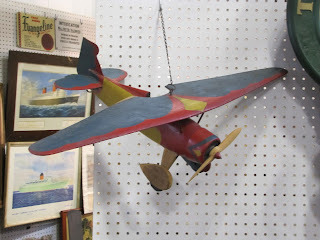 Nifty, colourful folk art airplane, J. E. Williams Antiques $425. At this point I want to wrap up this review. I apologize to all the dealers whose booth's and wonderful antiques and art are not included in my writing. It was a case of just too much to see, to photograph and document. In closing, I also want to acknowledge the work of the organizers and their team in putting this year's Cabin Fever event together. 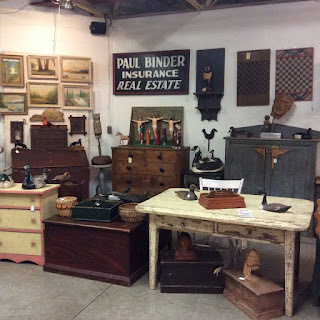 It is no small feat creating, promoting and implementing an antique show, especially in today's economy. Cabin Fever is such an important outlet for us all. Regardless, if you are participating as a dealer or as a collector, it remains the most important winter meeting ground for antique and folk art enthusiasts from around Ontario and beyond.